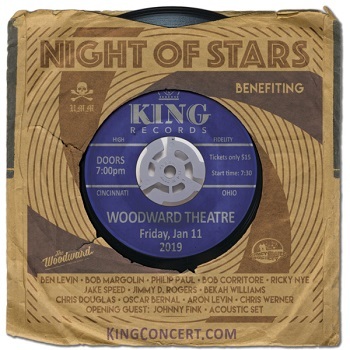 Raising money for King Records, this concert will feature Ben Levin, Bob Margolin (Muddy Waters band), Philip Paul (King Records session drummer), Johnny Fink, Ricky Nye, Bob Corritore, Bekah Williams and many other top local and national musicians. Can't attend? You can still donate HERE. King Studios is a non-profit, 501 (c) (3) dedicated to the efforts of preserving/restoring the Brewster Ave. King Records location. For more information, please visit www.kingstudios.org.